Want to keep your co-op strong? Have skills and experience to contribute? Central Co-op is a democracy governed by our owner-members, and we rely on the knowledge, wisdom and dedication of the owners who serve on our Board of Trustees and Nominating Committee. If you have a background in business or organizational management and/or strong connections in our community, please consider becoming a candidate. 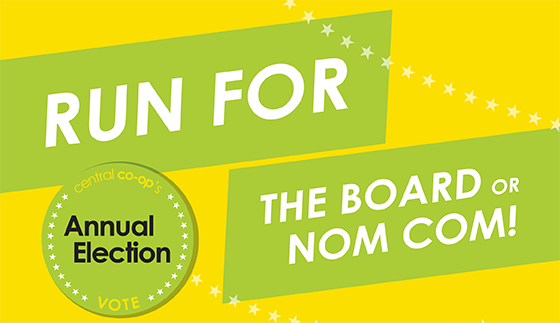 The more candidates there are, the better governance the co-op gets, so don't be shy! Applications are due January 20, 2019. Come to our Candidate Meet-and-Greet on January 16.